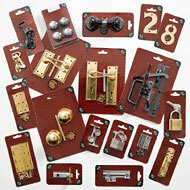 The Best Hardware range is our flagship range and consists of skinpacked and blister packed door furniture, black ironmongery, antique ironmongery, security, general DIY products, etc, packed in eye-catching, modern packaging and at competitive prices. To reduce costs and stockholding levels for stockists, the smaller products are packed in outers of 5 and the larger, more expensive products are packed in singles. Shown below is every product in the Best Hardware range ordered numerically by code number.